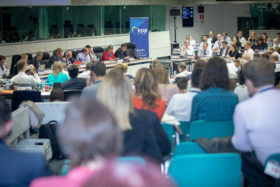 “The process for electing the EPP’s lead candidate has been carefully designed in a fashion that stays true to the EPP’s core values of openness, transparency and democracy. I am looking forward to the process generating fruitful debate about the future direction of our continent and delivering us a lead candidate who will retain EPP’s position as the first political family in Europe following the May 2019 European elections. All EPP candidates must be nominated in writing to the EPP President by 17 October 2018 at 12:00 at the latest. To be nominated, a candidate needs the support of his or her own member party, plus the endorsement of not more than two member parties from two EU countries other than the country of origin of the candidate. Only Presidents and Secretaries General of ordinary member parties are entitled to nominate and/or endorse a candidate provided that the candidate is a member of an ordinary member party. The candidates will be reviewed by the EPP Political Assembly in its meeting on 6 November 2018 and will, after validation, be submitted to the vote at the EPP Congress in Helsinki on 8 November 2018. The candidate that receives the absolute majority of valid votes will be declared elected. If there are more than two candidates and no candidate obtains the required absolute majority, a second ballot shall be held between the two candidates who got the highest number of valid votes at the first ballot. Abstentions are not considered valid votes. In the event of multiple candidates, the candidates will be presented on an alphabetical list. The Political Assembly has also launched a dedicated website for the EPP Congress helsinki2018.epp.eu and has adopted the procedure for voting regulation, the voting rules and the congress composition for the upcoming congress. The members adopted a resolution on Libya underlining the need for a sustainable political strategy to resolve the Libyan situation. Finally, the Political Assembly held a minute of silence in tribute to EPP co-founder and first Secretary General Jean Seitlinger and former US Senator John McCain, a friend of the EPP and transatlantic cooperation.